Peel Ports advise that the floating dock/converted barge Westmoreland, that has been moored between two large yellow mooring buoys to the north of the Lower Halstow Yacht Club moorings, has sunk. It is still made fast to the two yellow marker buoys fore and aft but is covered at high water. The centre of the barge between the two yellow buoys is marked by floating pellet buoys. Mariners should navigate with caution due to this submerged danger to navigation. Approximate position 51 23.00N 000 40.60E. The owner is aware and will be dealing with the situation. Peel Ports have issued a notice that the flashing white warning light on top of Garrison Point for big ships going in or out of the Medway is now working again. • When an inward bound vessel of more than 130 metres Length Overall is underway in the buoyed channel between the Medway Buoy and Darnett Ness the lights are exhibited in an upriver direction. • When an outward bound vessel of more than 130 metres Length Overall is underway in the buoyed channel between Darnett Ness and the Medway Buoy the lights are exhibited in a seaward direction. Further information may be obtained from Medway VTS on VHF Channel 74, call sign “Medway VTS” or telephone 0151 949 6148 or 0151 949 6650. Thanks to Roger Clark for sharing this information. Peel Ports Medway have made some alterations to the season for the collection of Annual Leisure Craft Conservancy and Yacht Mooring charges. Historically the Annual Leisure Craft Conservancy and Yacht Mooring Charges have been charged for the season 1st April – 31st March yearly. In the future, as from April 2019, the Annual Leisure Craft Conservancy and Yacht Mooring charges will be charged for the period 1st January – 31st December yearly. Therefore the 2019 charges will be pro-rated to reflect this change and the charge will show a nine months pro-rated charge from 1st April 2019- 31st December 2019. Going forward the charges shall be levied on the 1st January each year for the season starting 1st January 2020- 31st December 2020. If you need further assistance in the explanation of the new changes of the Medway tariff please do not hesitate to contact pauline.pardoe@peelports.com or telephone 01795 596444. 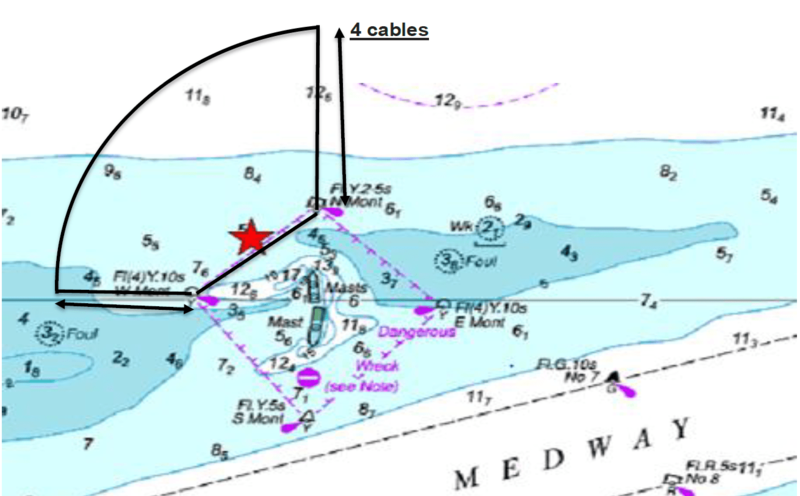 To clarify the previous article on our website, Peel Ports Notice to Mariners No 20 of 2018 warns us to stay at least 4 cables (approx 800 yards) to the north west of the restricted area marked by the yellow danger buoys around the Montomery wreck until 1st June 2019 (i.e. next year), as shown on this chartlet. The red star shows the location of the oceanographic recording equipment, which is only marked by three small red floats. Clubs and organisations which hold races and other events that go round the wreck, such as the Admiral’s Cruise, may need to find an alternative turning mark. From 23 May 2018 to 1June 2019 oceanographic recording equipment will be placed on the seabed just NW of the Wreck Exclusion Zone. The equipment consists of a seabed Lander marked by 3 red buoys and deployed NW of the Wreck Exclusion Zone for the entire period. 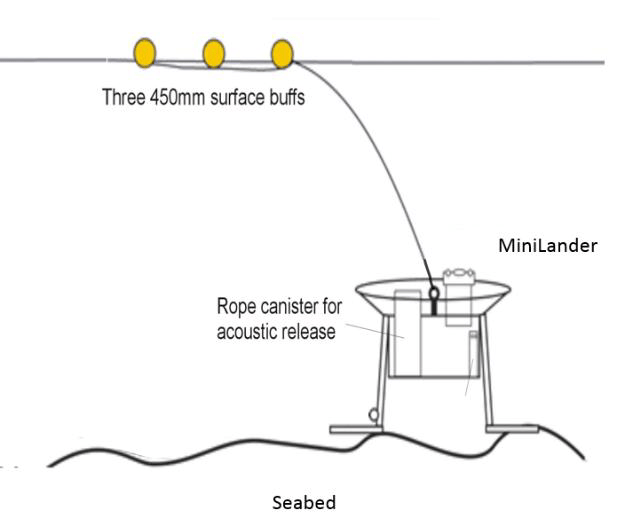 Mariners are requested to keep a minimum of 4 cables clear of the exclusion zone marked by the permanent yellow buoys. John Wall took a video of the police RIB chasing the PWCs up the Medway on 28 April. There is a 6 knot speed limit upstream of Folly Point and the wash from speeding vessels is a danger to boaters in dinghies going to their moorings. The MSBA has a CCTV camera at Gillingham Strand, where the PWCs are usually launched, to monitor antisocial and irresponsible activities on the river. It’s official! Medway Vessel Traffic Service (VTS) will relocate to Group Port Control Centre (GPCC) on 1 May 2018. Medway VTS is a Traffic Organisation Service (TOS), as defined in IMO Resolution A.857 (20). There will be no change to the TOS status of Medway VTS upon relocation. Medway VTS will continue to be available on VHF Channel 74 and by telephone on (0151) 949 6656.